For other uses, see Herzliya (disambiguation). Herzliya (/hɜːrtsəˈliːjə/; Hebrew: הֶרְצְלִיָּה [hɛʁtsɛliˈja]; Arabic: هرتسيليا‎ [hɪrtsiːlja]) is an affluent city in the central coast of Israel, at the Northern part of the Tel Aviv District known for its robust start-up and entrepreneurial culture. In 2017 it had a population of 93,989. Named after Theodor Herzl, the founder of modern Zionism, Herzliya covers an area of 21.6 square kilometres (8.3 sq mi). At its western municipal boundaries is Herzliya Pituah, one of Israel's most affluent neighborhoods and home to numerous embassies, company headquarters, as well as prominent Israeli business people. 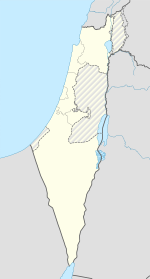 Herzliya, named after Theodor Herzl, was founded in 1924 as a semi-cooperative farming community (moshava) with a mixed population of new immigrants and veteran residents. During that year, 101 houses and 35 cowsheds were built there, and the village continued to grow. The 1931 census recorded a population of 1,217 inhabitants, in 306 houses. Upon the establishment of the state in 1948, Herzliya was a town of 5,300. Large numbers of immigrants settled there, and it had 12,000 residents within a few years. In 1960, when the population reached 25,000, Herzliya was declared a city. Under current plans, the city's population will triple to around 290,000 by 2030, with 52,000 new homes and new industrial developments and hotels built, with more dense construction in the city center while expanding the city to the north and southwest. According to the Israel Central Bureau of Statistics, residents of Herzliya are among the wealthiest in Israel. In 2003–2005, average monthly salaries were NIS 8,211, or about NIS 1,500 above average in a survey of Israel's 15 largest cities. However, there is a large gap between the city's seven working-class neighborhoods, among them Yad Tisha, Neve Yisrael and Neve Amal, and upscale Herzliya Pituah. The population is older than that of other cities in the Sharon region: 18% are under 14 years old, compared to a national average of 27.5%. Investment in education was higher than all other cities in the survey and more high school students were eligible for a bagrut matriculation certificate. The Herzliya Interdisciplinary Center is a private college that was founded in 1994 by Prof. Uriel Reichman, who serves as its president to this day. Israel's largest television and film studio, Herzliya Studios (Ulpanei Herzliya), is located in Herzliya. The Herzliya Marina was built in the 1970s. The city has a small airport, three shopping malls (Arena Mall, Seven Stars Mall and the Outlet), movie theaters, museums, cultural centers and a stadium. In 2008, the Herzliya Cinematheque opened in the downtown area of the city. In a 2008 survey of 15 Israeli cities,[which?] Herzliya ranked second in fiscal management. The Herzliya municipality ended 2006 with a sizeable budget surplus. One of the founders' homes has been turned into a museum Beit Rishonim documenting the history of Herzliya. The Herzliya Museum of Art is part of the Yad Labanim memorial complex. West of Herzliya is Sidna Ali, a Muslim holy site. To the northwest is Tel Arsaf (Arsuf) and the Apollonia National Park. Inhabited from the Persian period until the Crusader period, the site contains the remains of the Crusader town of Arsuf, including a fortress surrounded by a moat. Another archaeological site, Tel Michal, lies on Herzliya's Mediterranean coast 4 kilometres (2.5 mi) south of Arsuf. Since its inception in 2000, the Herzliya Conference has become an annual summit of the most influential Israeli and international leaders. The conference is attended by government ministers, Knesset members, senior defense officials, leaders of the Israeli business community, senior academicians, media representatives from Israel and abroad, delegates of world Jewish organizations, foreign dignitaries and Israeli diplomats. The city has two football clubs, Maccabi Herzliya and Hapoel Herzliya, both of which are based at the 7,100-capacity Herzliya Municipal Stadium. The Bnei Herzliya basketball club plays its games in HaYovel high school arena. Herzliya is also one of the centres of rugby union in Israel. One of the city's main attractions is Sportek Herzliya, an outdoor 120 dunam sports compound open for public usage. Some of Israel's most expensive homes and finest beaches are in Herzliya Pituah, a neighborhood on the west side of Herzliya. Herzliya Pituach is a sought-after venue for high-tech companies, and its marina, many restaurants and entertainment spots have turned this part of Herzliya into a vibrant hub of Israeli nightlife. A makeshift strip located around the current Herzliya Airport was used as the main operating base of Israel's first true fighter aircraft (as opposed to makeshift use of light planes), Avia S-199, during 1948 Arab–Israeli War. The airfield was used as it was a bit back from the front-lines, and was clandestine since it was a purpose built strip, that was constructed after the beginning of hostilities, in between the orange orchards around Herzliya, and didn't appear on published maps. On June 11, 2002, Hadar Hershkowitz (14) was killed in the 2002 Herzliya shawarma restaurant bombing. On May 30, 2006, Re'ut Feldman (20), a resident of Herzliya, was killed in the Kedumim bombing. ^ a b c d e Shemes, Hen; Dattel, Lior. "Herzliya: For the Young at Heart, Not the Young". Retrieved 2008-10-18. ^ a b "Herzliya". Israel Wonders. GoIsrael.com. Retrieved 2008-10-18. ^ "Herzliya to triple in size by 2030 - Globes English". Globes. Retrieved 18 March 2018. ^ "English Information - סינמטק הרצליה". hcinema.org.il. ^ "Herzliya gets its very own cinematheque". Jerusalem Post. 2008-11-20. Archived from the original on 2013-07-06. Retrieved 2008-11-30. ^ "ראשי, בית ראשונים". brishonim.org.il. Archived from the original on 2010-08-19. ^ "Herzliya Museum - Homepage". herzliyamuseum.co.il. ^ Herzog, Ze'ev (1993). "Michal, Tel". In Stern, Ephraim (ed.). The Encyclopedia of Archaeological Excavations in the Holy Land. 3. Jerusalem, Israel: The Israel Exploration Society, Carta. pp. 1036–1041. ISBN 965-220-211-8. ^ "Welcome to the Institute for Policy and Strategy and the Herzliya Conference". Herzliyaconference.org. Archived from the original on 2009-01-23. Retrieved 2009-05-05. ^ "War Is Boring - From drones to AKs, high technology to low politics". War Is Boring. Retrieved 18 March 2018. ^ "A funeral instead of graduation," Archived 2011-06-12 at the Wayback Machine Tovah Lazaroff, June 13, 2002, Jerusalem Post. ^ "2BackToHomePage3". mfa.gov.il. Archived from the original on 2012-10-15. ^ "Re'ut Feldman". GxMSDev. Archived from the original on 2011-11-28. ^ "Banská Bystrica Sister Cities". © 2001-2008. Archived from the original on 2009-03-02. Retrieved 2008-10-23. ^ "Beverly Hills street to honor Herzl". Retrieved 2010-05-03. ^ "Funchal". Retrieved 13 January 2017. Wikimedia Commons has media related to Herzliya.